During high school, in the depths of the 1980’s, my friend Gnat got a job working at the Guitar Exchange. It was a local retail establishment, a music shop about the size of a storage shed, which served as a hangout for teenage stoners with Van Halenian aspirations. Gnat being just such a guitar-shredding, heavy metal acolyte, this seemed the perfect environment for him to pretend to be gainfully employed. The Guitar Exchange was owned by a guy we’ll call Ed Gravy, because I’m not very good at pseudonyms. Ed may have had a passion for guitars, but it was clear from the air of surrealist insanity that permeated his store that his real ambition had been to be the fourth Stooge. There was a kind of madcap hostility Ed liked to engage in that hardly seemed conducive to good salesmanship (they even recorded a radio ad celebrating “Customer Abuse Week” at the Guitar Exchange). Ed enjoyed humiliating his clientele and his staff. Ed didn’t hire Gnat for his retail skills, for it was clear to anyone who laid eyes on Gnat that he was barely fit for social interaction of any kind. Ed hired him for Gnat’s cheerful willingness to degrade himself on command. He was made to learn and recite oaths of servitude, full of difficult alliteration, like Lewis Carroll responding to a drill instructor at Fort Bragg. There were special dances Gnat was expected to perform. 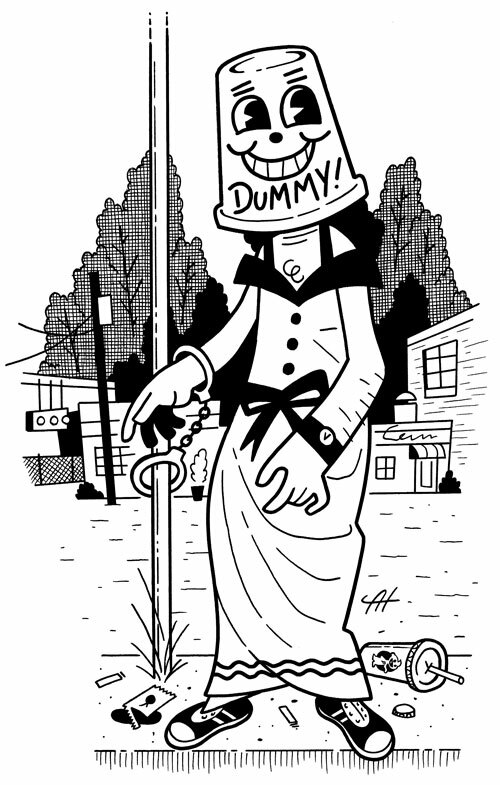 “Pig dances.” If Ed was displeased with Gnat’s performance, he was made to wear the “dummy bucket,” a plastic mop pail with a cartoon face and the word “dummy” scrawled across it. Not only did Gnat appear to genuinely enjoy this abuse, the dummy bucket seemed to be the highlight of his day. I think about Gnat’s roadside disgrace often nowadays, because similar visions along the highway are becoming far more common. The first time I saw one of these sad individuals hired to advertise a business by parading signage down the sidewalk, I had one of my typically naïve responses. “Oh, look!” I said. “That jaunty fellow in the Uncle Sam costume has decided to make his job more joyful by dancing a little jig! Such fine spirit he has!” Of course, after a moment’s consideration, I realized the horrible truth. This was a pig dance, in a dummy bucket, and he had been commanded to perform it. You’ve seen these pitiable creatures, of course, gyrating in their cow costumes or dressed like giant pizza slices, twirling signs for the big closeout sale at Mattress Barn. They look like sports mascots after the bank foreclosed on their dugout. Not long ago, I watched one of these costumed hustlers sweating in the sun, giving passing motorists the pitch for discount sportswear, when what did I see standing right next to the guy? A panhandler with a cardboard sign. The panhandler’s outfit was considerably less festive, and he didn’t quite have the same hustle (though probably sweating less than the guy wearing the zebra head). His sign didn’t have the same pizzazz, either – something about being desperately poor and hungry – and frankly, I thought the typeface he chose for his logo was a little too rustic. The contrast in the salesmanship of these two was pretty remarkable. The panhandler’s was more of a soft-sell, you might say. I know some people have principled reasons for avoiding panhandlers, and I have a few rules of my own about dealing with them. For example, the guy asking me for a dollar in the parking lot while wearing $200 Reebok’s probably isn’t getting my money. If I covet any part of your wardrobe, chances are I need the dollar worse than you. But generally speaking, if someone’s level of desperation has forced them to confront strangers and ask for spare change, I’m willing to give them something just for having the guts to do what I could never do myself. I mean, I can’t even bring myself to ask someone for jumper cables. And if their story of need is particularly good, packed with dramatic elements like military heroism, broken-down cars, or a need for the cat’s ear medicine, I give extra. I came across one guy outside the drug store once who was showing off a bleeding knife wound in his gut that needed its medical attention financed. I gave him some money AND I bought him some gauze. But some will coldly suggest that these hobos simply need to get a job, or at the very least, a banjo and a tip jar. To these armchair civil engineers I recommend that they look across the street to the woman dancing in the Statue of Liberty outfit. This, I say, is perhaps the job for which you’re suggesting the panhandler should apply, a retail repurposing of the street-corner begging you were just complaining about. You’re suggesting these people should give up their lifestyle of freelance degradation and literally become a dancing monkey for The Man. Corporate America seems to agree that the best solution for street hustling is simply to co-opt it. Could the traditional panhandler learn a thing or two from the Wall Street visionaries? Would the sunburned war vet turn a better profit at the freeway off-ramp if he advertised “30% off – this weekend only” on his cardboard? Would he generate more interest dressed as Little Bo Peep? And why not a little dance, grandpa? Everyone likes good entertainment! If they can make that work, they’ve utilized the true independent spirit that makes this country great. To them I tip my dummy bucket. It was only after Gnat quit the Guitar Exchange that he watched "Deliverence" and realized that all of the Guitar Exchange humor and "Outlaw Country/Western" lyrics. ,,,Were based on the dialog of "Deliverance" in which Ned Beatty is "cornholed".